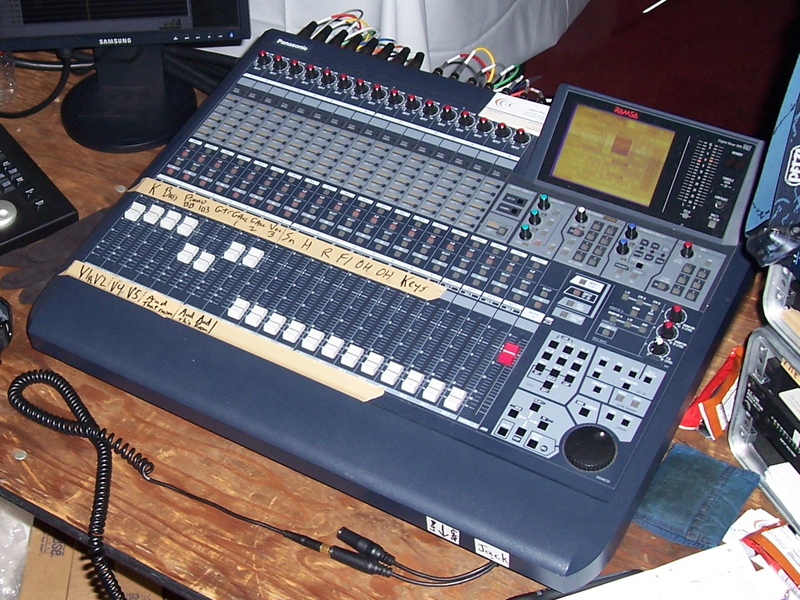 The Panasonic DA7 (also known as the WR-DA7 or branded as Ramsa) is a fully automated 32-channel 8-bus digital audio mixer with 24-bit converters and SMPTE/video option. It has great-sounding compression and EQ on every channel/bus, surround monitoring, and 50 snapshot memories. Multiple DA7s can be linked in tandem to operate as a 64-channel integrated mixer. Each DA7 has 16 channels of analog input built-in, plus your choice of up to three interface cards: 8-channel analog A/D-D/A, TDIF, ADAT, 8-channel AES, or Tandem. Dimensions: 21.6 inches (550mm) deep x 27.5 inches (700mm) wide. Weight: 51 lbs without option cards. For more mixing operations, see another user's introduction video here. The DA7 was released shortly after and competed with the Yamaha 02R. The 02R had 20 bit AD/DA converters while the DA7's converters were 24 bit (except the aux sends/returns which were 20 bit). The 02R had built-in compression, EQ and reverb, while the DA7 had compression and EQ but did not have reverb. Opinions generally favored the DA7's compression and EQ as more natural-sounding. The 02R's built-in analog inputs were 8 XLR, 8 mono 1/4" TRS, and 4 stereo on 1/4" TRS pairs. The DA7's built-in analog inputs were 8 XLR and 8 1/4" TRS. The 02R had 4 optional I/O card slots, and the DA7 had 3 slots (both offered cards with analog, ADAT, TDIF, AES, tandem etc). The DA7 could receive 24 channels though the card slots plus 8 channels of analog, or 16 from the cards plus 16 analog. The mkII revision of the mixer incorporates all of the features of previous DA7 software revisions, plus the various minor hardware mods that have occurred since day 1. The hardware mods seem minor and/or cosmetic to me, but some users have been bothered by two issues addressed in the mkII: a noisy fan and a talkback mic prone to feedback. These two issues did not affect me, either because the mods were stock by the time I got my boards, or they are just too minor to be bothersome. The software is referred to as version 2.5, which (compared to 2.01) just adds a few new shortcuts and the option of 3.1 surround. The new mkII CAN operate in tandem with a "mkI" DA7, so perhaps it would be a perfect way to expand a current DA7. There appears to be no way for an owner of the original "mkI" to load the new 2.5 software (so 2.01 is the end of the line for mkI owners), but there was briefly a physical upgrade program offered by Panasonic (expired 7/2001). The upgrade cost $395 and included everything except the new colored surface. I assume that a mkI post-upgrade can load post-2.5 software. The hardware mods in the MkII are seemingly minor, but yet enough to make the mkII different enough that the 2.5 software will not work on a "mkI" unless it is upgraded. To me, this is not that big a deal. The DA7 is a mature board which has all of it's major software updates and bugfixes implemented. The mkII is not too alluring, unless you are a first time buyer. As a current owner, I am not too envious of the "new kid." If anything, it just seems to be a repackaging for marketing purposes. Many improvements were added in version 2.00. DA7 Version 2.01 operating system was released 5/2000, adding Mackie HUI emulation for controlling Pro Tools, Digital Performer, etc. Bring up the CUSTOM/MIDI fader layer with the fader layer button. In the MIDI/SETUP screen, setup your MIDI output channels and turn on "Tx"
Under "Table setup" you can edit what type of controller message gets sent by the MIDI layer fader (128, 64 or 2 step) or knob. Under "Command mode," you can edit what Control Change number, or pick "FREE DEF" and enter Hex strings. I could get the TC M3000, a Digitech TSR-24S, and a TC M-One to "see" incoming MIDI. The Digitech reverb has options to assign a cc to a function, and I got it to change presets. But that's as far as I got. Here is my list of my wished-for DA7 improvements (In three sections, "Urgent", "wish list," and "bugs"). Most of these were not addressed in the final updates so now they are just issues to watch out for. 1. Make it easier to "select" a channel during automation to view it's settings. At least remove the requirement that the board be in "MMC" mode. Plus, if "record automation" is off, holding down the select button for 1 second could have brought up the channel's settings page. Leaving "MMC" mode on makes cursoring around a pain. 2. More Automation Mixes!!! Four is not enough. With very four complex automated mixes I have not used much of the memory, so that's not a limiting factor. Even if storage space is the reason for so few automation mixes, expand the memory. RAM is always cheaper than my time, and it's easily worth the cost to replace a chip. Loading to/from the computer is one way to work around this, also useful for backing up data. 3. The DA7 needs to be able to send an Aux return channel to any Aux send. Otherwise, I can't feed reverb to the studio headphones without taking up an analog input (1-16). Ditto for sending a Bus to an Aux send (which adds more multitracking routing possibilities). This might have been intentional, to prevent novices from creating a feedback loop. 4. The DA7 needs a simple way to move automation data from one channel to another. Moving a channel's settings is easy for an "unautomated" channel or snapshot, but there needs to be a similar "Multi-channel view" automation data channel copy feature. The only workaround is to alter the individual automation events. Difficult for channel on/off, maddening for fades. 5. Toggle "relative automation mode" between two options: "punch out writes adjustment to end of mix" vrs. "punch out does not affect the rest of the mix". 6. In the "automation execute" window, the "Start Scene" button is between the two most commonly used buttons in the "automation execute" window ("rec" and "edit parameter"). Accidentally hitting it after a mix has been created might be disastrous. Additionally, a button is really needed to recall the start scene easily (to edit), without having to go to the "scene memory rd/wt" window and recalling scene "0". I have to do this dozens of times per session (although the "10 scene key recall" helps a lot; but if "MMC" mode is on, this doesn't work [see #1 above]). Be able to choose which individual inputs of 9-16 are digital and which are analog as opposed to the current all/none setup. Sidechain "keying" of compressors, by any other channel's signal. Also, the compressors should have a "soft knee" setting. Make automatable: aux send on/off, pre/post, aux send panning (when aux sends are linked as stereo pair). Also, compressor/delay functions need to be automatable. Without the link/stereo buttons automatable, linked pairs are stuck as linked pairs- a mono channel library can not be recalled, and channels must remain in stereo pairs. Automation "relative" up/down indicators (next to virtual fader in channel view window), or dots next to fader indicating present fader moves while overwriting them. Similar to automation systems on boards from Neve, SSL, etc. Hey- even the Yamaha 02R has this! When over writing a fade over an old fade, duplicate automation data events are created at identical time/frames, causing "Stuttering/chattering" faders. It is not correctly combining the two relative levels. Two simultaneous fades on one channel with different levels!?! What causes this duplicate data? Is new data not being integrated into previous data/interpolated correctly? Automation comes out of record occasionally? Why? When undo is hit? Press the INPUT 1-16 button and the CUSTOM/MIDI button simultaneously. The faders will immediately clear themselves of all settings, and will perform the recalibration. This will take several seconds. When this operation is finished, the faders will return to the positions they were in before the recalibration (but you should have saved your previous mix anyway). It is a good idea to periodically recalibrate the faders. It can increase the accuracy and performance of the moving fader system. The following are potentially dangerous reset functions that could erase your DA7's memory. Be CAREFUL with these. Power up while simultaneously holding the "select" and "on" buttons on the "lr master" strip and the "1" button on the numeric keypad. The display will read;"Upgrade? OK or Cancel"
IF YOU CHOOSE "OK," YOUR DA7'S OPERATING SYSTEM WILL BE ERASED! If you are ready to download new software, choose "ok", otherwise you should hit "cancel." I used this the one time the DA7 froze up on me, and wouldn't respond to a simple restart. MAKE SURE to hit cancel unless upgrading software. For more info, check out Silent Way's list of DA7 digital mixer sites, and the Panasonic DA7 User Group.